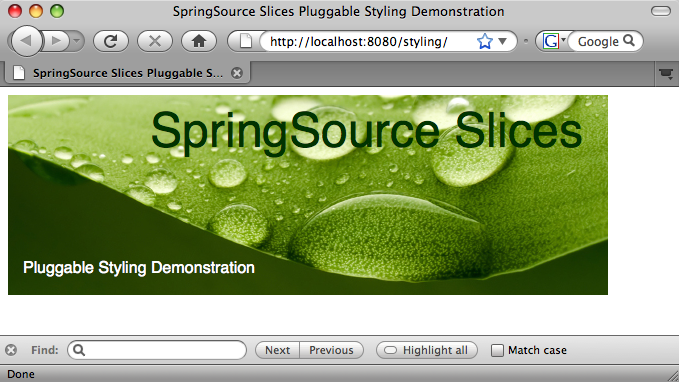 Since we announced SpringSource Slices, a number of users and customers have asked about using Slices to make the styling and branding of their Web sites pluggable. 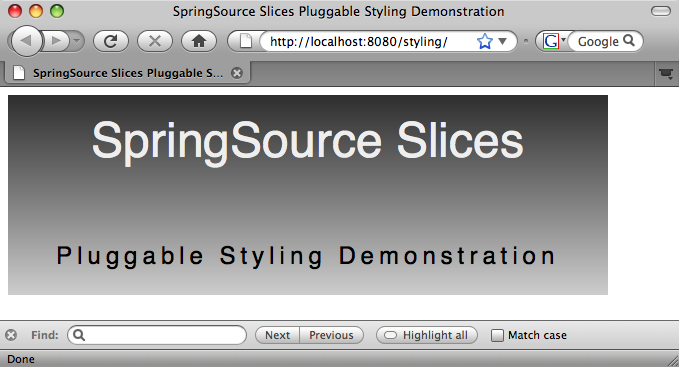 In this blog, I’ll demonstrate how easy it is with Slices. [2009-07-10 15:20:46.183] fs-watcher <SPDE0048I> Processing 'CREATED' event for file 'styled.host.war'. [2009-07-10 15:20:46.525] fs-watcher <SPDE0010I> Deployment of 'styled.host' version '1.0.0' completed. [2009-07-10 15:20:46.539] Thread-19  <SPWE0000I> Starting web bundle '/styling'. [2009-07-10 15:20:46.965] Thread-19  <SPWE0001I> Started web bundle '/styling'. [2009-07-10 15:28:30.699] fs-watcher <SPDE0048I> Processing 'CREATED' event for file 'plain.style.slice.war'. [2009-07-10 15:28:30.789] fs-watcher <SPDE0010I> Deployment of 'plain.style.slice' version '1.0.0' completed. [2009-07-10 15:34:48.948] fs-watcher <SPDE0048I> Processing 'DELETED' event for file 'plain.style.slice.war'. [2009-07-10 15:34:49.038] fs-watcher <SPDE0012I> Undeployment of 'plain.style.slice' version '1.0.0' completed. [2009-07-10 15:36:01.064] fs-watcher <SPDE0048I> Processing 'CREATED' event for file 'green.style.slice.war'. [2009-07-10 15:36:01.146] fs-watcher <SPDE0010I> Deployment of 'green.style.slice' version '1.0.0' completed. It’s incredibly easy to take advantage of this capability of Slices. 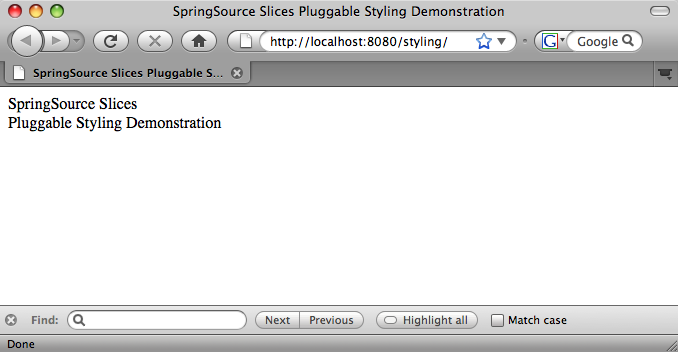 This Filter will route any requests with a path that matches any of the Hosts’s Slices to the matching Slice. If it doesn’t find a matching Slice the request is simply passed through to the Host. As we saw above in the index.html file, the host is looking for all of its styling within the /styles directory, but doesn’t actually provide this content itself. The source code for the war files that I’ve used above is available in the samples/pluggable-styling directory of the Slices Git repository (git://git.springsource.org/slices/slices.git). Also, take a look at Rob’s announcement blog which includes details of how to build Slices and install it into dm Server.